A global brand like Elle Decoration needs global music, and of course the soundtrack is provided by the marvellous Putumayo World Music. 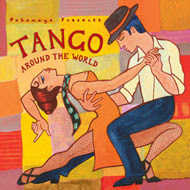 The first person to shoot a mail to elledeco@elledecomag.co.za naming one of the artists on the newly-released Tango Around the World will win a copy of their very own! Remember to include your name and postal address in your email. PS: Even if you’re not the winner, you can get into the tango mood by listening to some of the tracks off the album here.